A Greek Orthodox priest has been found slain after being kidnapped near the Syrian capital of Damascus, the Syrian government and the Vatican news service reported Thursday. The body of the Rev. Fadi Jamil Haddad, pastor of St. Elias Church in Qatana, outside Damascus, was discovered in the Jaramana district of the capital, reported Agenzia Fides, the Vatican news service. The site was not far from the area where he was kidnapped by an “unidentified armed group" last Friday, the agency said. The official Syrian news service said the priest was found with a gunshot wound to his head. The government news agency blamed the crime on “terrorists,” its usual characterization of the armed opposition fighting to oust President Bashar Assad. According to the official account, the priest was abducted while seeking the release of another person who had been kidnapped by militants. But it was not clear if the priest’s slaying was political, sectarian or criminal in nature. Many Syrians have complained of a breakdown in law and order and a spike in kidnapping for ransom and other crimes as security has deteriorated. Opportunistic criminals have moved to take advantage of the nation's security void. The Vatican news agency reported that the priest’s kidnappers had demanded a ransom equivalent to about $715,000 for the priest’s release. “It was, however, impossible to find the money and meet this exorbitant demand,” reported Agenzia Fides. The Greek Orthodox population is considered the largest Christian denomination in Syria, where Christians represent perhaps 10% of the population. Syria is overwhelmingly Muslim. Christian leaders in Syria say their community, which has ancient roots, is in a precarious position. Some Christians have joined the rebellion and called for Assad to step down. But many Syrian Christians back Assad, whose administration has been tolerant of religious minorities even as it has crushed political dissent. Assad has tried to rally support among Christians and other minorities against the armed rebellion, which is led by the nation's Sunni Muslim majority. There have been reports from Syria of government efforts to arm Christian communities. But some Christian leaders have urged their co-religionists to remain neutral in the conflict. Some Christians voice fears that Islamists will take over the secular Syrian government and that the nation will experience the kind of sectarian violence, including the bombing of churches and torching of Christian shops, that ravaged neighboring Iraq after the U.S.-led invasion toppled Saddam Hussein. Hussein, like Assad, was a secular autocrat who tolerated Christian religious practice. Tens of thousands of Iraqi Christians fled to Syria in the aftermath of Hussein’s fall. A Greek Orthodox priest who tried to negotiate the liberation of a Christian doctor in Damascus province was found dead on Thursday, residents and the Syrian Observatory for Human Rights said. "The corpse of Fady Haddad, kidnapped last Friday (October 19), was found this morning in Damascus province," said the Britain-based Observatory. "He was negotiating the release of a Christian doctor with the kidnappers, who demanded 50 million Syrian pounds ($660,000). He had managed to reduce their demand" by half, he told AFP on condition of anonymity. Theft and kidnapping have become rampant in Syria, where criminals have taken advantage of the security vacuum caused by the fighting between rebels and the army. "Last Friday, he went along with the doctor's stepfather to pay the ransom, but they were also abducted and the kidnappers had increased their demands before the priest's body was found on Thursday," the resident added. Rare in a country plagued by civil war, state news outlets and opposition websites alike paid tribute to Father Haddad. The Orthodox Patriarchate condemned the "savage crime" and denounced "attacks against civilians and religious figures who try to be messengers of peace under these difficult circumstances." It further called on humanitarian organisations and the public to "condemn all crimes and robberies which undermine the safety of citizens." The Syrian National Council, the main opposition bloc in exile, called Father Haddad a "symbol of national unity," and blamed pro-regime militiamen for his killing. 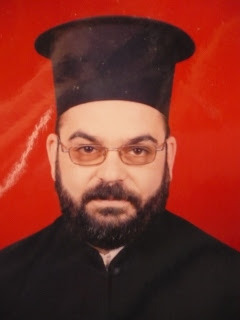 "The gangs belonging to the regime killed Father Fady Haddad in order to drag the country into sectarian strife," SNC spokesman George Sabra said, calling for an official judicial investigation into the murder. "National unity in Syria and in the town of Qatana in particular is too solid to be undermined by ignorant and hateful acts," Sabra added. "Father Fady was one of the symbols of national unity. Grant mercy on Father Fady Haddad, a martyr of the nation and humanity, and shame on those criminal killers who are destroying the country." "O Lover of Mankind, inasmuch as You are the God of Peace and Father of Mercies." We ask God's rich and abundant mercy for our beloved departed martyr and we turn to him for mercy for our people, our beloved nation, and for all the peoples and countries of this afflicted Middle East.